Canadian Olympian Tory Nyhaug enters the 2015 Toronto Pan Am Games with international experience. Canadian BMX star Tory Nyhaug can't remember a time in his life when he didn't turn to a bike for enjoyment. "I could ride a two-wheeler when I was two years old with no training wheels," he said. "My uncle knew about the (local BMX) track, I went out and tried it and just loved it right away." Nyhaug was four at the time. By age nine, he was competing at the junior world championships. "Since then it's been basically just full-time BMX," he said. Nyhaug's steady rise has taken him from the Canadian junior team to the elite senior level. He raced at the London Olympics in 2012, won world silver last year and is a medal favourite at this month's Pan Am Games. "It just progressed from one level to the next," Nyhaug said in a recent interview. "Soon I was racing pro and racing World Cups and that was the new normal. I can't remember dreaming about (becoming a pro), I just kept progressing until I was at that point." The sport made its Olympic debut in 2008 in Beijing, one year after its Pan Am debut in Santo Domingo. 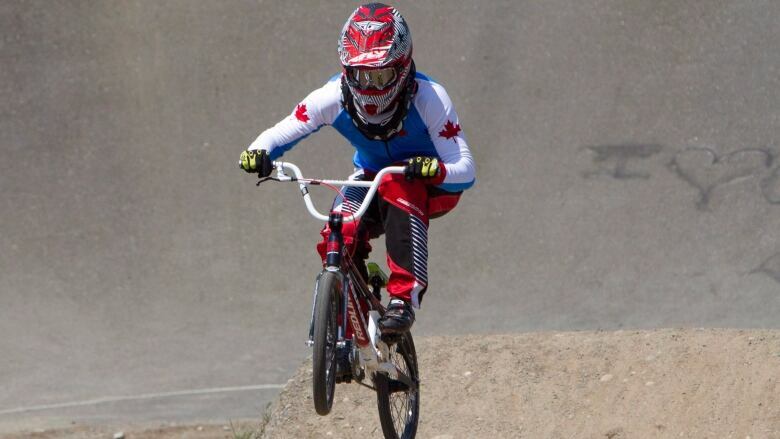 In Toronto, the men's and women's competition will be held July 11 at the Centennial Park Pan Am BMX Centre. Riders start from the top of a ramp and manoeuvre their bikes around a 350-metre track filled with jumps, bends and corners. Speeds can reach 65 km/h in what is often a rough—and-tumble race to the finish. "A single gear and just a rear brake that you try not to use too much," Nyhaug said. "And we never sit down." Injuries are common in the sport and the 23-year-old from Coquitlam, B.C., has certainly had his share. Nyhaug has had concussions, broken bones, even a ruptured spleen that was removed less than three months before the 2012 Olympics. He was back training a week after the surgery and was the lone Canadian BMX racer to compete in London, settling for an 18th-place finish. "It's an action sport and it's dangerous," he said. "Any time you go on the track, you've got to be really careful because it doesn't matter how technical the track is, it can happen at any time. I've definitely had some bad injuries over the past but I'm lucky. I have such a great support system around me ... I've been able to recover from everything." The leadup to the Pan Am Games has been similar to his Olympic experience. This time, Nyhaug's preparation was hampered by a broken foot that he suffered late last year. "The past six months was just all about rehab and getting back to 100 per cent," he said. "Coming into the Games, I feel great and I feel ready." Nyhaug learned a lot from his London experience and feels he has made strides with his mental approach of late. "I think I've just matured a lot as an athlete," he said. "It's a young sport and it forces you to grow up really quickly. I think I've really improved over the last few years with my maturity." Many athletes are using the Toronto Games as a building block ahead of the 2016 Rio Olympics. Nyhaug would love another crack at the Summer Games but admits he doesn't think too far ahead when it comes to racing. "I just want to make sure that by the end of my career, I don't have any regrets and I know that I did everything I possibly could in training and in racing," he said. "Obviously there are going to be disappointments in the sport. Our sport is pretty up and down especially. "But if I can look back and know that I did everything I could and I (earned) the best results I possibly could — whatever they may be — I'll be happy." Other members of the Canadian BMX team include Jimmy Brown and Daina Tuchscherer, both from Airdrie, Alta., and Amelia Walsh of Ayr, Ont.